Here is a Special Link to 1979 Graduates Guestbook . . .
Visit our class website: http://www.GIHS1979.myevent.com. 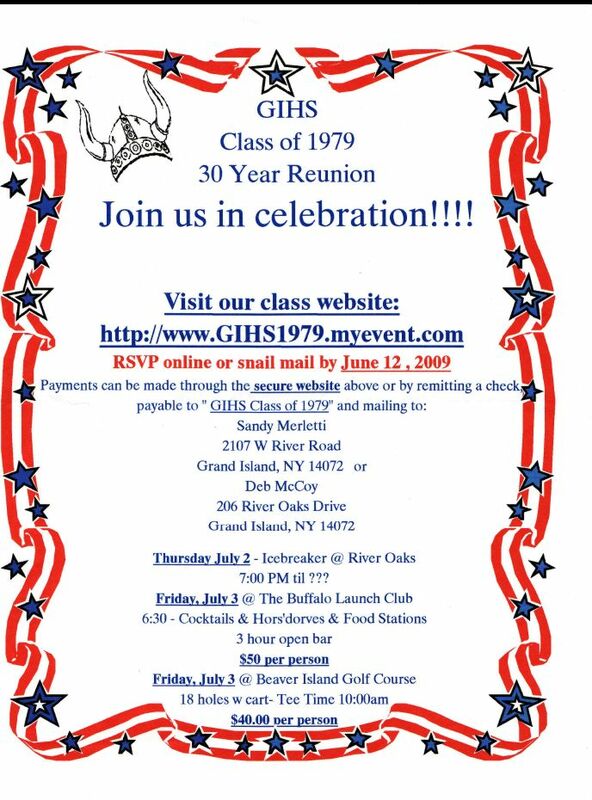 Classmates of the Grand Island High School Class of 1979 are celebrating their 30th high school reunion. The dates are set!!! 4th of July weekend, of course!!! An informal get-together will be held Thursday evening, July 2, at River Oaks. Golf Friday at Beaver Island, for those interested. Update your contact info, so we can e-vite you. Scan your photos, and upload to Kerry Sciandra Erling http://www.GroupUsUp.com to be included in "The Reunion Video" Deadline for photos June 1, 2009. Class Of '79 Reunion - FLYER!! A 25 year reunion planning meeting of the Class of 1979 will be held 7 p.m. on May 20, 2003 at River Oaks. Contact Karen Hayes Smith, 773-2624, if you are interested in helping with the plans.